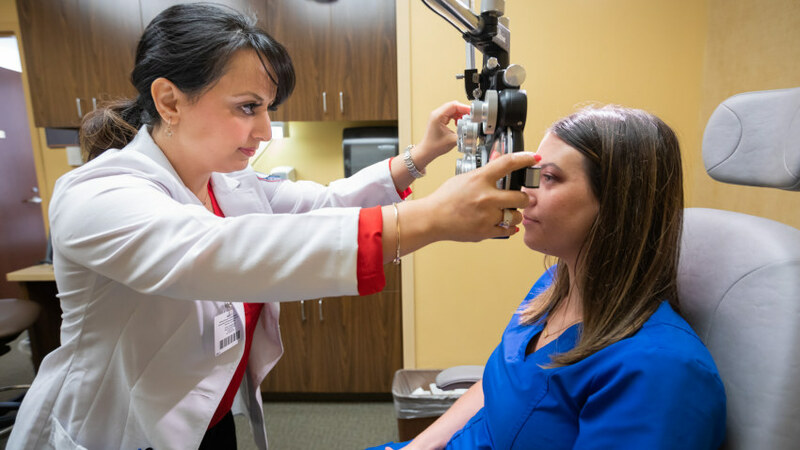 After Dr. Roya Attar earned two bachelor’s degrees, her doctor of optometry and a master’s degree, she provided comprehensive eye exams to patients of all ages and launched her avocation for public health. It wasn’t long, though, before she combined a passion for learning and a love for teaching to better serve her profession. The 2013 graduate of the Rosenberg School of Optometry at the University of the Incarnate Word in San Antonio, Texas, paid it forward. Attar helped found the Kentucky College of Optometry at the University of Pikeville, Kentucky, in 2014. She served as an assistant professor and director of professional relations, all the while continuing to provide comprehensive optometric services. “I did a little bit of everything,” said Attar, whose family emigrated to the United States from Iran when she was 6. While at the University of Pikeville, Attar also obtained her Master of Business Administration from the Coleman College of Business. Today, she’s trailblazing again. Attar recently became the first optometrist on faculty in the University of Mississippi Medical Center’s Department of Ophthalmology. It’s the perfect pairing of the two fields of eye care, said Dr. Kimberly Crowder, professor and chair of ophthalmology. “She will help our patients by giving them critical access to care,” Crowder said. “For routine exams, she will be much more accessible than the rest of us are. Attar said training to become an optometrist is very different from learning to become an ophthalmologist. “Following a bachelor’s degree, you can enter optometry school. It’s a four-year program,” she said “The first two years are mainly composed of didactic and clinical teaching, followed by another year of mainly clinical training and seeing patients, and then a one-year externship. She said the main difference is that graduates of optometry school can immediately start practicing and seeing patients; graduates of a four-year medical school must complete a residency to specialize in ophthalmology before going out to practice. Attar grew up in Houston, Texas, and graduated from high school a year early. She received a scholarship to attend the University of Memphis. “We had some family there, and it worked out,” she said. She said she decided to join UMMC’s Department of Ophthalmology as “the next step in my career” after enjoying a mix of teaching and clinical duties at the Kentucky school. “I wanted something that could be equivalent to that,” she said. Finding a job at UMMC was “serendipitous,” she said. Crowder said the pairing of optometry and ophthalmology will give UMMC patients more timely and appropriate care. As a public health advocate, Attar emphasizes eye care is just as important as primary care. Attar said she looks forward to working with ophthalmology residents to explore incorporating optometry into their practices. “I love building relationships,” she said. “I hope to get everyone on campus to get their eye examinations here, quickly and efficiently. I want to elevate our optical services to have more choices on frames and contact lenses. She said she also would like to begin a low-vision clinic for patients with challenges that include macular degeneration and eye trauma. “We want to make sure that all of our patients are cared for properly and in a timely fashion, and to have the products they need and not to have to go outside of UMMC to get the frames they’re interested in,” Crowder said. “We want to build better relationships with all of the optometrists in the state and community.